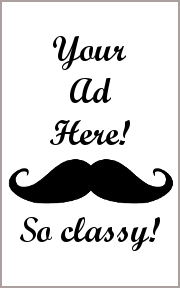 You are a dragon without a legend…time to make one! You have finally come of age. Your wings are strong, your dragon flame burns like the sun, and your teeth are as sharp as a thousand swords. Now you must make a name for yourself and spread fear and panic across the realm. There are castles to attack, knights to eat, treasure to hoard, and maidens to collect. The only problem is that there are other dragons with the same idea and there are only so many maidens to be had. 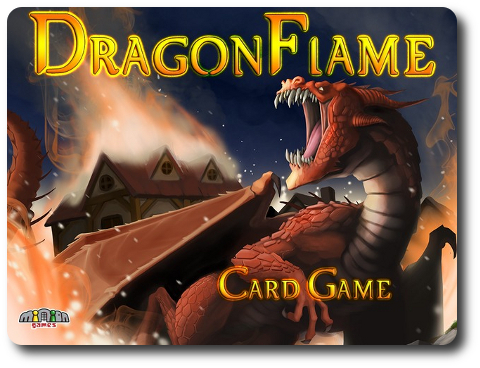 Dragonflame, designed by Matt Loomis and to be published by Minion Games, will reportedly be comprised of 9 Village/Field cards, 14 Castle/Banner cards, 91 Main Deck cards, and 75 Fire tokens (in 5 different colors, 15 per color). As this is a review of a prepublished copy of the game, we will not comment on the component quality. The illustrations by Clay Gardner and Rob Lundy are excellent and strengthen the game’s theme wonderfully. Note: The following game set up is for a 3 or more player game. 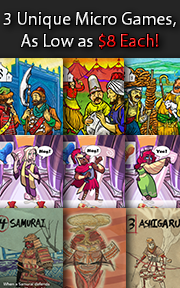 See “Game Variants” for a summary of how the game is set up for a 2-player game. To set up the game, first separate the cards by type. You should have a pile for the Village/Field cards, the Castle/Banner cards, and the Main Deck cards. Return the green banners found in the Castle/Banner card pile to the game box. 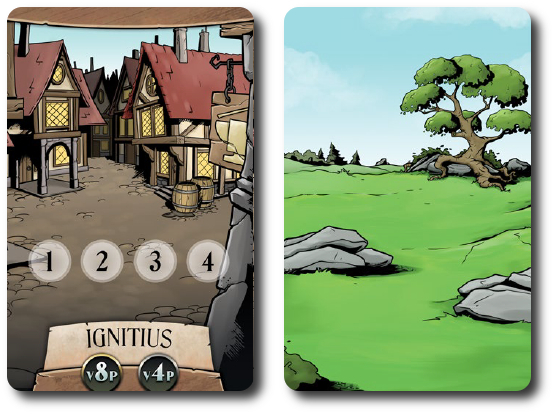 The Village/Field and Castle/Banner cards are double-sided. This review will note which card side being used during the game. Second, if playing with less than 5 players, find and remove from the game cards in the Main Deck that have a small “V” found at the bottom right-hand corner of the card’s face (18 in total). Third, take 1 doubled-sided Field/Field card and place it in the middle of the playing area. Take the remaining Village cards and shuffle them, Field side up. Then deal the Village cards around the middle Field card. When placing the cards to the table, place them with the Village side face-up. The end result will be a 3×3 grid created by the cards with 2 Fields and 7 Villages showing. Fourth, take the Castle/Banner deck and separate the blue and red Banners. Starting with the Banner cards with the highest numbered banners, remove Castle/Banner cards until the total number of cards in each banner color is equal to the number of players, plus 1. Removed Castle/Banner cards should be returned to the game box. 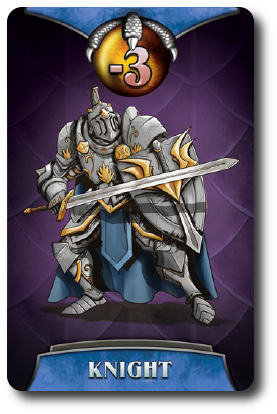 Fifth, shuffle the kept red Castle/Banner cards and deal out 1 to each player, Banner side face-up. The remaining red Castle/Banner card is set aside and will be used later in the game. 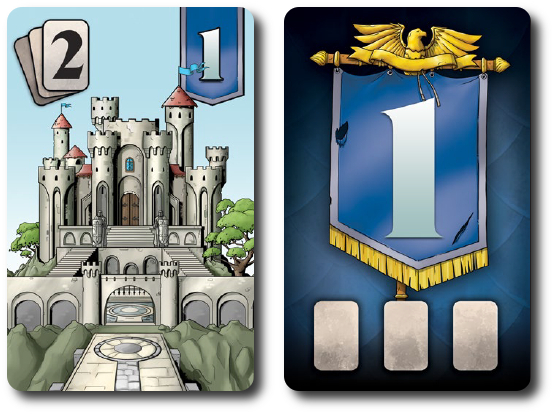 Sixth, place the blue Castle/Banner cards next to the 3×3 grid of Village/Field cards, Castle side face-up, in ascending order from left to right. Seventh, give each player 15 Flame tokens in the color of their choice, placing any that are not used back in the game box. Seventh, shuffle the Main Deck and deal each player 3 cards, face-down. Place the Main Deck to one side, face-down. Note that there is no discard pile in this game. Cards are never returned to the Main Deck once they are dealt. That’s it for game set up! Time to see what kind of dragon you are. But before you take flight and go burning sheep, a quick word on Relic cards, as they are very important to a dragon’s quest for glory. These objects of power are highly sought after by adventures and dragons alike. 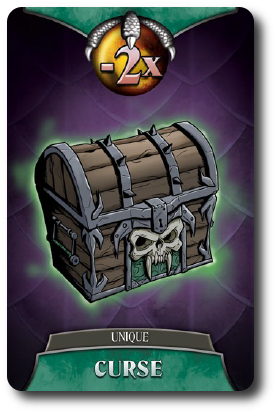 If a player is lucky enough to snag one and add it to their hoard, the Relic card is placed face-up in front of them. Each Relic card will detail when it can be used and what it does. If used correctly, a Relic could give the player a real advantage and opponents’ a real headache. The only problem with a Relic is that they are worth zero points at the end of the game. This means that Relics are tools and their overall value will only be determined by the player who uses them. In the right hands, a Relic could be the difference between victory or defeat. Dragonflame is played in rounds. During each round, players will be attacking, burning, and being a general nuisance. A typical round is summarized here. The Banner cards the players were dealt during game set up determine the player’s turn order sequence. Starting with the player with smallest Banner number and continuing in ascending Banner number order, each player will place 1 Main Deck card on a Castle card of their choice. Played Main Deck cards are placed face-up or face-down in accordance to the card icon color and position on the player’s banner card. For example, the player with the “1” blue Banner card would place their first, second, and third cards face-up (white card icon). A black card icon indicates that the card is played face-down. Additionally, the Castle cards the players are playing cards to have a defined card limit that can be played to them. If the number of cards currently on the Castle card equals the card limit number, no more cards can be played to the Castle card. So, in summary, Castle cards define HOW MANY cards can be played to it and Banner cards define the player’s turn order sequence and the facing of the Main Deck cards when played to Castle cards..
Players continue to play 1 card at time until all players have played their 3 cards. The end result will be some Castles with lots of cards, some with none. On any given Castle card, a Main Deck card could be face-up or not. Starting with the first player and continuing in player turn order sequence, each player will select 1 Castle card to attack. After selecting a Castle card to attack, the player takes that Castle card and any cards on it, placing it in their play area. Any cards that were face-down on the Castle card are now turned over. If there are any Dragonflame cards, they are resolved now. The cards collected are referred to as the player’s “hoard”. Dragonflame cards give the player the ability to burn Village cards. Each Dragonflame card will have a number value. This number indicates how many Village cards (or spaces) the player can nuke with their dragon flame. Players cannot add the values of multiple Dragonflame cards together. Before deciding what Village cards the player wants to burn, they must first determine their path. A Dragonflame path is always vertical or horizontal and starts on any card on the outside of the 3×3 Village grid. The number on the Dragonflame card then determines how many cards the player can burn. For example, a Dragonflame card with a “2” would mean the player can burn 2 Village cards, going left or right, up or down, in accordance to where the player started on the 3×3 Village grid. After burning everything possible, the Dragonflame card is discarded from the game. If the player should ever run out of Dragonflame tokens, they cannot resolve Dragonflame cards and must discard them. After all the players have added cards to their hoard and resolved Dragonflame cards, it’s time to reset the playing area for the next round. Any cards on Castles not attacked are now picked up and discarded from the game. Collect the Banner cards from the previous round, along with the Banner card that was set aside, and flip them to the Castle side. Organize the Castle cards so they are in ascending order below the 3×3 Village grid. All players now flip over their Castle card they attacked to show the Banner side. The number on the Banner is the player’s new turn order number and the facing of the Main Deck cards they will play. Finally, each player is dealt 3 Main Deck cards to add to Castle cards. The next round is ready to begin! The endgame is triggered when setting up for a new round and only 1 card remains in the Main Deck. This signifies that the current round will be the final round of play. After the final has been completed, it’s time to determine which dragon has become a terrifying legend. Any Relic cards a player may have are set aside. The rest of the cards in their hoard are now collected. Points are scored as follows. Statues: Each status is worth 5 points, but only if they are unique. If a player has 2 or more of the same statue, they will not score any points for that specific statue type. Chests: Each chest is worth a number of points equal to the number of chests with the same name. For example, only having 1 “Stash of Silver Pieces” would award the player 1 point, but having 3 “Stash of Silver Pieces” would give the player 9 points (3+3+3). Jewelry: Each sparkly piece of bling-bling is worth the point value indicated on the top of the card. Princess: Each is worth 1 point for every unique named treasure in the player’s hoard. 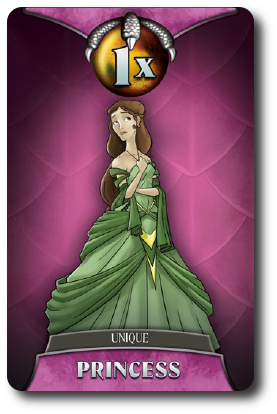 A player can only score 1 Princes per game, meaning a second captured Princess is discarded when scoring. Curses: Each will reduce the player’s total score by 2 points for each unique named treasure. If a player has more than 1 Curse card, they discard all but one Curse card. Curses work just like Princesses, but in reverse. Villages are now scored and added to whatever points the player earned from their hoard. Only Village cards that have had all their numbered spaces filled by Dragonflame tokens can be scored, however. Points are awarded by determining who did the most damage. This is calculated by counting the number of each player’s Dragonflame tokens on the Village card. The player who did the most damage gets the highest number of points listed at the bottom of the Village card, the player who did the second most damage gets the second most points, and so on. If more players contributed to the Village card’s destruction than there are points to be awarded, some players will go without points. All ties are broken by determining who burned the Village card first. Finally, the payers turn the Castle card they just attacked over to the Banner side and add the Banner number to their score. In summary, a player’s score is determined by the total points earned from their hoard, the total points earned from burning villages, and the value of their last Banner card.. The player with the most points wins the game and is truly a legendary dragon of awesomeness. Dragonflame can be played with 2 players if there are only 2 dragons to be had. The game play is the same, but the game set up is different. In summary, the red Castle/Banner cards are not used and all Main Deck cards with a “V” and a “II” are removed from the game, as well. The number of Village cards are also reduced, leaving the players a 2×3 Village grid to burn. To learn more about Dragonflame, visit the game’s web page or visit the Kickstarter campaign. The Child Geeks LOVED Dragonflame! I was concerned if they would understand how the game was played, due to the hidden information, but they quickly reduced all my fears to smoke. One of the most entertaining observations was when a younger Child Geek calmly placed 2 Main deck cards on a low numbered Banner without anyone really paying attention to him (but I was). An older Child Geek grabbed the Castle card the younger Child Geek was placing cards on. The result? Two Knight cards for a total of -6 points! OUCH! Totally awesome. According to one Child Geek, “I think the best part of this game is trying to figure out what castle to attack and how best to burn the peasants.” Another Child Geek said, “At first, I didn’t get why we should bother playing cards face-up or face-down, but now I know to be scared of a Castle card with too many face-down cards!” All the Child Geeks voted to approve Dragonflame, finding it to be a fast game to learn and an easy game to love. The Parent Geeks were also impressed with the game and how subtle the difficulty of the game was. According to one Parent Geek, “Now this is a neat idea. The game play is super easy, but you really have to pay attention in order to make the right choices.” Another Parent Geek said, “At first, I didn’t think that burning villages was all that important, but now I see why I need to pay real close attention to castles and the local peasantry.” Even the non-gamers got into the game, finding the hidden information element of the game play to be particularly intriguing. According to one non-gamer Parent Geek, “I like how some castles have cards that are shown and some that are not. Makes it very interesting when it comes time to attack a castle.” Finally, one Parent Geek said, “What I really like is that each choice matters three times. It matters in the moment, it matters in the next round, and it matters when you score points at the end of the game. That’s pretty heavy.” All the Parent Geeks voted to approve Dragonflame. The Gamer Geeks recognized many of the game play elements in Dragonflame. and went to work attempting to determine if the game was worth their time. After the first round of play, the Gamer Geeks paused, reflected, and smiled. The second, third, and later rounds only strengthened their smile. There was much boasting, bragging, and table talk to be had as players “tricked” their opponents into collecting cards, beat each other to burning the villages, and going out of their way to bluff the heck out of each other. And I think that is what won the Gamer Geeks over so easily. According to one Gamer Geek, “What I like about this game – and I mean really like – is how crafty you have to be to give bad cards to opponents, show just enough information to tantalize them, and then bask in the glory that is yours when you totally fool them.” Another Gamer Geek said, “This is a really tight game. It is a much deeper game than I originally thought and there are some very interesting strategies and tactics to explore.” And finally, one Gamer Geek said, “I don’t feel like a dragon, but I definitely feel burned. This is a great game.” All the Gamer Geeks voted to approve Dragonflame. Jeepers, where to begin with this game? First off, I am really liking how portable and small the game is, but what a big game playing experience it provides. There is always just enough information to know where you might or might not stand when the game ends. A quick look at the Village cards also gives you a lot of information, but not the full picture. I think that is the best aspect of the game – the lack of total clarity. There is always a “fog of dragon smoke”, so to speak, where you know just enough to make decisions, but not necessarily accurate ones. That really spices up the game play when it comes time to picking castles, burning villages, and playing cards. There is always more than one thing to consider. Do not discount the Village cards in this game. Collecting treasure is nice and whisking away princesses is always a good time, but the real money is burning down settlements. I cannot decide if it’s a stroke of genius or just dumb designer’s luck (no offense meant, Mr. Loomis), but forcing players to burn on a grid’s straight line and occupying Village card numbers with limited tokens really makes you sit up and take notice when others are burning things to the ground. Every number of the Village card is a potential point and position to break ties. And you will break ties. Oh, goodness, yes. My only advice when it comes to villages is this: “get burning early”. You want in on the ground floor when the village burns to the ground. For only being a prototype, Dragonflame played like a completed game. Which, honestly, I think it is. Not sure what the Kickstarter will add, but what I was given was fantastic from start to finish. This was a game I kept thinking about after it was put away and was excited to teach when there was table space to be had. It played well with everyone and having players with mixed skill levels didn’t harm the game play for families. In fact, I found the Child Geeks to be better players, mostly because they didn’t spend so much time pondering and worrying. They played what they thought was right and collected what they wanted most. They didn’t always win, but they always had a great time. In my book, that makes them winners. Do take a look at Dragonflame when time allows. It’s a cool game that just might leave you feeling a bit hot under the collar towards your tricky opponents. And for the love of all that is awesome, BURN THOSE VILLAGES!!!!! I want to play this game with the kids! 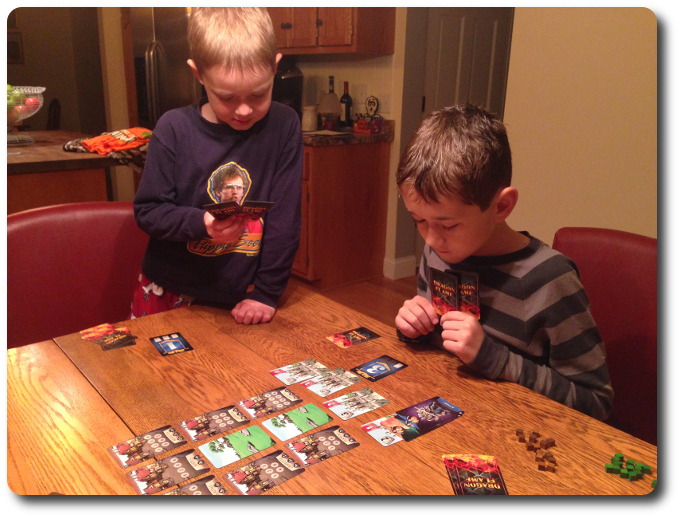 Sounds like they really loved it — even a 5 year old is starting to be a better game player than I am.